I love finding interesting Canadian ingredients that I can add to recipes. In this case, it was the Yuzu infused maple syrup from Quebec. The flavour is quite unique with a distinctive citrus twist and when I tasted it, I thought, “this does not belong on pancakes”. Enter Maple Glazed Salmon. Salmon is so great with some sweetness and of course, citrus and salmon are perfect together. So far so good, but it needed some zing. Enter Sriracha! The combo of flavours make this salmon a Canadiana-Asian fusion dish that you won’t be able to stop eating. Everything in moderation, except for this salmon recipe. 1. Preheat oven to 400 degrees. Line a baking sheet with foil, shiny side up. Lay the salmon on top of the foil. Sprinkle with salt and pepper. Set aside. 2. In a non-stick sauce pan over medium-heat, melt the butter. Stir in the Yuzu infused maple syrup, Sriracha, lime juice, grated lime rind, tamari sauce, and minced garlic. Bring to a boil, then reduce to low heat and cook for 3 minutes. Remove from heat. Sauce will thicken off of the heat. 3. Pour about 1/2 of the sauce over the salmon and use a spatula to generously cover the salmon with a thin layer. 4. Wrap the foil around the salmon to create a steam pack. 5. Bake for 15 minutes on the middle rack. 6. Remove the salmon from the oven an open the foil to expose the salmon. Set the oven to Broil on high. 8. 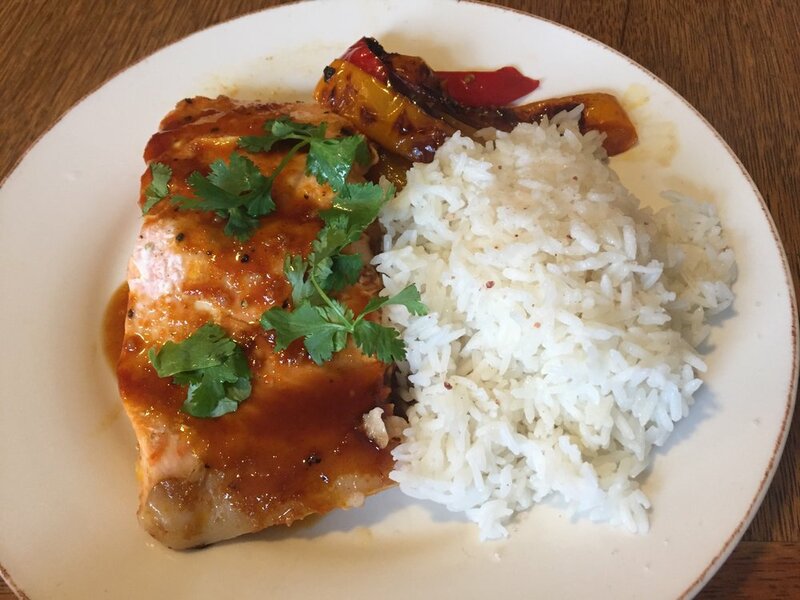 Top the salmon with remaining sauce, fresh cilantro and serve alongside steamed white rice and sautéed bell peppers.